1. The original 15-year investment frame has been doubled. With the Spanish investment, you get two rolling contracts, each for 15 years. 2. You exit and receive money in year 31, not year 30. 3. The currency’s changed. These Spanish truffles are priced in U.S. dollars. Invest US$51,563 for 100 trees, and you’re looking at an Internal Rate of Return (IRR) in the region of 16%. In year 31, you exit having received just over US$600,000. However, invest US$77,965 and this 600k return could change to just under one million dollars. These estimated returns are high, but I’m confident. There’s a lot of science behind this project. At Christmas, Esteban de Paz joined the team as Estate Manager. Esteban has a number of years managing truffle plantations in New Zealand and, for the last two years, he’s advised clients specifically on Spanish plantations. He is the world’s leading Consultant Agronomist in the field of truffles and assisting him is Alistair Irving. To ensure the quality and purity of the plantations, their lab checks every truffle used in the spore inoculations that are down on the tree roots. Estimated demand is at least 10 to 20 times more than production. Truffles are often called the “diamonds of the kitchen” because they are so expensive and so desired. Chefs all over the world use them. Customers all over the world want to see them on menus. The smell and flavor of truffles is particular, like nothing else. 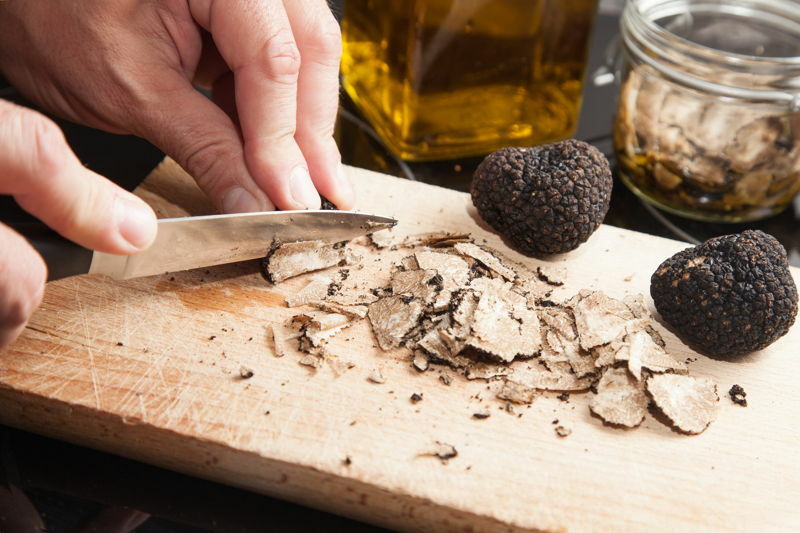 Michelin-star U.S. chef Thomas Keller uses truffles in many dishes ranging from “Salmon ‘Chops’ with Celery and Black Truffles,” to truffle-infused custards. The reasons for putting agriculture into your portfolio are straightforward. The world’s population will probably reach nine billion by 2050. It’s growing and it needs feeding. Specifically relating to truffles (a luxury food), disposable income is increasing and this affects food consumption trends. More income means more eating out in fancy restaurants like Thames Keller’s and more expensive supermarket purchases. I agree with Jim, but I don’t want to pick up a shovel and become a farmer. This Spanish truffles investment, however, is turnkey. You stand to get 16% IRR without breaking a sweat. With anticipated profits this high, it wouldn’t surprise me if this investment sells out like the French one did, so get in touch here before it’s too late. Lief Simon is the Director of Overseas Property Alert . Lief has lived and worked on 5 continents and traveled to more than 70 countries. His real estate investing experience began more than 20 years ago with a multi-unit building in Chicago. After selling that building for a leveraged total return of more than 1,800% in 2 ½ years, Lief began to diversify internationally. In the two decades since, Lief has personally purchased more than 45 properties, investing in 26 different countries around the world. He has developed land, managed rentals, and flipped pre-construction buys. Lief has more experience buying and profiting from real estate around the world than any other individual investor you’re likely to find anywhere.